Comics: It's in the bag! The last one I can't help you with. I used to pay for storage to keep mine out of the house (and out of my wife's way), but these days I've got them tucked in the corner of a bedroom, stuffed in my office closet, and a few boxes just sitting around as I attempt to catalog what I have (we'll talk about my cataloging efforts next week). Right now, I've been taking a slow and steady approach to getting things cataloged and bagged/boarded. The truth is, for about a decade, I pretty much gave up on bagging and boarding. 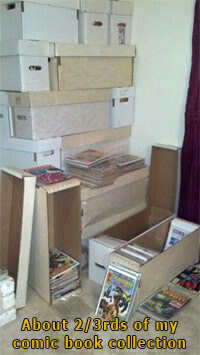 I got tired of the expense, the effort, and I was just reading comics and putting them into storage boxes. Part of this was fueled by a movement back in the 1990s that was preaching that cheaper bags would break down over time and actually hurt your comics. The thinking was that it was actually better to put your books into a simple acid-free box and leave them in the dark, rather than have your bags slowly break down into some sort of petro-chemical goo over time. So I was content to leave the books in the boxes for a few years. Then the moisture came. Even though I was paying $50 a month to have my stuff in a climate controlled unit at a Public Storage facility in NW Houston, I sill had a problem with moisture getting to one of the boxes. Now, to be fair, this was caused by a hurricane ripping the roof off part of the unit and water got into part of the facility. I can't blame them for that, and the hole wasn't actually near my unit. But they didn't fix it for almost EIGHT WEEKS! During that time, the entire "climate controlled" floor felt like a rain forest and the box of comics closest to the door got some kind of condensation thing going, which messed up about 50-100 books. It didn't ruin them, but the bottoms have a little moisture warping. Fortunately, there wasn't anything super great in that box, but the copy of my thesis (and some other personal papers) were destroyed by the moisture. Naturally, their value was too low to claim on my insurance. I would not rent at that particular Public Storage facility again (14451 Texas 249, Houston, TX 77086). That incident (and another that I'll tell you about next week) made me decide it was time to start bagging and boarding again. Right now, I'm buying locally. The fact is, if I want my comic book store to be there in the future, I need to support it. So, I've been buying my bags in small quantities as I need them from Bedrock City Comics. 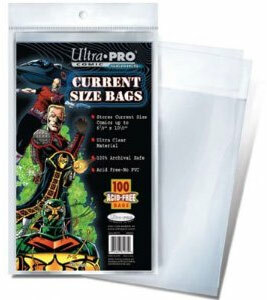 A container of 100 Ultra-PRO comic bags costs $5.99 plus tax. These are standard-quality bags (not mylar -- which I'll explain some other time). The Silver-Age bags also cost the same amount (comics have gotten a little smaller over the past few decades, so that modern comics are just slightly smaller than comics printed in the 1960s and 1970s). A container of 100 acid-free backing boards sells for $9.99 (again, plus tax). These come in separate containers so I have to combine them (that is, slip one board into each bag). It's not a big deal as I usually do it while watching TV or a movie. It actually goes pretty quickly, and my wife has offered to help when I finally get around to ordering a whole bunch of them. And that is definitely on the horizon. Right now, the combination of the board and bag runs about .15 cents per book. If I had to bag all 10,000 comics (and I don't), at that price it would cost me $1,500. Even though a bunch of my comics are already bagged and boarded (and as I revealed last week, I'm an unrepentant fiend who double-bags his comics), it's still a sizable expense. That's why I've been talking to the nice folks over at Bags Unlimited about buying in bulk from them. I can get 2,500 bags for only $75 (that's 3 cents a bag). Likewise, their backing boards sell in bulk for about 4.5 cents each. These prices don't include the freight costs, but even still, supplies in this quantity run about half the retail cost of buying them locally. Plus, I actually need a few specialty items that my local comic shop doesn't carry, such as boxes and bags for storing comics digests (I'll talk about that some other time). I estimate the storage expenses for my collection will run about $300. I'm planning to place the order soon and I'll fill you in on exactly what I order and what I think of the materials when I get them, so stay tuned True Believers! Check back on Friday for a rant about why I hate buying groceries at night! When you look at the numbers, it doesn't look good. I've got about 10,000 comic books, digests and magazines. Not a bad horde, actually, stuffed into about 22 long boxes and about a dozen short boxes. When you consider that some of these were purchased at the newsstand (okay, convenience store -- I grew up mostly in the suburbs and not down the street from Freddy Freeman's newsstand in Fawcett City) as far back as the mid 1970s, that's probably not all that many. Persective from a Wife / Mom / NASCAR fan: "How much money did you waste on those things? Are they worth anything now?" Perspective from a Fanboy over 40: "You've only got 10,000? That's not bad... I had that many back in 1992... To bad the market crashed on 'em." Perspective from a Fanboy Under 30: "You've got 10,000? Cool! Do you have any of that old school stuff like New X-Men or before Spider-Man #300?" I've got some cool stuff in there (yes, I've got the obligatory 1980s books like Frank Miller's Daredevil, some early New X-Men, Wolfman & Perez's tenure on Teen Titans, and so on). But I've also got some stuff that most people would puzzle the average fanboy and fangirl. No, I'm not talking about the embarrassment that was Team America, or Stan Lee's "New Universe" debacle. (And by the way, this team has NOTHING to do with the awesome film, Team America: World Police by the South Park dudes.) No, this isn't embarrassing stuff, it's just stuff I like that's a bit outside the norm for most collectors of my age. Things like funny animals, Archie (I still subscribe to a few titles which I will discuss in future blogs), Ren & Stimpy, and ALF. Yes, the comic book devoted to the irascible Alien Life Form that starred in his own titular TV travesty. 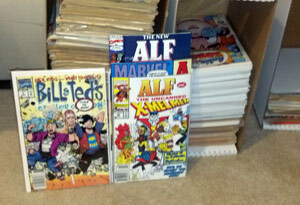 Okay, ALF wasn't that bad, it's just I can't resist a good alliteration when I get the chance.Over the years I've collected more than a long box full of odd titles like ALF, Ren & Stimpy, James Bond Jr. (no kidding, I found JBJ #1 neatly bagged in that aforementioned long box), and even Bill & Ted's Excellent Comic Book. Yup. Got a whole box of this stuff... which leads me to my a confession of one of my darkest secrets. You see... the fact is, I've got a lot of these odd comics. So many so that it's cost-prohibitive to board and bag them all. Good bags ain't cheap. Oh, they're not overly expensive (even in today's economy). But the truth is, with thousands of comics, I just can't afford it. So, I do something dark and loathsome... I double-bag some of my comics. I'll wait while your collective gasps travels the world via cyberspace. I know, some of you have just spewed your Super Big Gulp all over the screen. Others may have accidentally dropped a puppy or shrieked in horror. I only pray that no one was driving while reading this on their smart phone and crashed into a bus-load of nuns (I often wonder why so many nuns travel via bus... I always picture it as some sort of scene out of Where Angles Go, Trouble Follows). Even though this particular clip has nothing to do with nuns in buses, you can watch the theme song clip from Where Angles Go... while you recover (think of this as a "Family Guy" cutaway gag). We now return you to your regularly scheduled confession of a dark secret. Yes, I said the unthinkable: I double-bag some of my comics. That is to say, I take a perfection good bag and board and put two books in the same bag! Yes, that's right, I grab all that pulp goodness and I just stuff it in there. I said it and I don't care who knows it. Go ahead, write to me and tell me how the back of the board isn't 100% acid free and that, over time the book will become damaged. Go ahead, and I will laugh in the face of your superior knowledge! Yes, laugh and scoff. Because, you see, I know the risks. I know that -- at some point in the distant future -- the cruel hands of time shall pass forward on the clock of eternity and these books might be less than perfect. I know, and I don't care. You see... it's an ALF comic. I seriously doubt it will ever be popular enough to sell for the big bucks it will take to save the family farm (okay, not my family's farm, but someone else's). I enjoyed it when I read it (and even reread an issue recently for the awesomely funny X-Men parody) and I want to reasonably protect it from moisture and marauding kitties (I'll tell you about that particular danger some other time), but I'm not going to pay 15 cents or more to protect each and every single copy. I'm just not going to do it. So, I got the larger Silver Age bags and fit 14 issues into three bags. They're snug, but they actually fit quite nicely. I could probably get two more issues into the set if I had do. Yes, you heard me right. I got 14 comics into three bags. That means I'm not just a double-bagger, but a multi-bagger. Bawah hah hah. Again, I know not the meaning of the word "contrition." All kidding aside, I've had many of these comics in storage since the mid 1980s. In fact, the bulk of my horde has been in storage for 12+ years, and to be honest, they look fine. The bags have not significantly degraded. They are still firm and clear without any oil residue. Likewise, almost all the backing boards are crisp and clean with no image transfer on the backside. In short, multi-bagging these comics has not harmed them. There are a few exceptions, though. I did find a few books where the bags were feeling weird and oily. These were from before 1982 and they have a soft, matte feel to them (if you know what I mean). These were very old bags, and in the past 30+years, even in storage in a dark box in a climate controlled storage facility, they obviously degraded some. The comic inside feels okay (no staining or discoloration of the cover or the interior pages where they touch the plastic on the outer edges). Those are the bags I've replaced. I'm hoping the new-and improved plastics will last more than 30 years. After that, it may not be my problem any more. By that time, they'll probably be looking to preserve ME in a mylar bag! I caught a cool movie on Netflix the other night while I was browsing around in the various genre categories. I was in the mood to chill out and wanted to see something that I had not seen before. I definitely found it in The Last Lovecraft: Relic of Cthulhu. Here's the plot from :IMDB: Jeff is an ordinary guy that is stuck at a dead end job with a boring life, but when a strange old man gives him an Ancient relic and tells him that he is the last bloodline of H.P. Lovecraft, He and his friend Charlie embark on an adventure to protect the relic piece from falling into the hands of the Starspawn and his minions that wish to reunite the relic and release Cthulhu back into the world. Or, to put it another way (in my own words), an ancient cult is trying to resurrect Cthulhu and a secret society is trying to stop them. It turns out that H.P. Lovecraft was an adventurer who discovered the truth about these evil creatures and he wrote his stories to get the info out there, but disguised it as fiction so only select people would be aware of it. Lovecraft, by the way, was immune to Cthulhu's psychic powers, and that immunity has been passed down through his bloodline. The Last Lovecraft: Relic of Cthulhu is available as a streaming download via Netflix, or you can buy it from amazon.com. This is a very low-budget movie with a few really good things going for it. First and foremost, it's got Cthulhu. I mean, who doesn't love seeing the one of the Great Old Ones in a movie every now and then (and please, if you play Call of Cthulhu and want to correct me on some minor point about how he's technically part of the Great Old Ones, then you are possibly too geeky even for me to hang out with). Secondly, the title sequence is actually top-notch. It uses comic book style art and really does a great job of capturing the feel of the material, while looking pretty darn cool while doing it. Okay, the acting isn't the best on the planet, and some of the make up is a bit... well, "Sci-Fi Channel" if you know what I mean. Oh, wait. I'm sorry... I meant "SyFy" (I still think that sounds more like a disease than a cable channel, but what the heck. They can mention my anger about that and the demotion of Pluto from planetary status on my tombstone.). Yup, the effects are a bit weak and the make up is a bit cheesy, but that really doesn't detract from my enjoyment of the film. In fact, a beer in hand on a Friday night will often find me seeking out the cheesiest movie I can find... and this definitely fits the bill. I think, for me, one of the funniest things about this movie is the absurdity of the plot, and how it would look if Gamers really had to save the world. In short, this is not about butch guys with mondo combat skills trying to save the day, it's basically about a guy who works in a crummy office and his jerk of a roommate finding out that Cthulhu and all that crazy stuff is real, so they hunt down the biggest geek they knew in high school so he can tell them how to defeat The Great Old Ones. With the bad guys on their trail, they wind up on a really bad road trip into the desert to find the only one who ever fought Cthulhu and lived... Captain Olaf. The good Cap'n lives in the desert, you see, because he wanted to get as far away from the Deep Ones and Cthulhu as possible. 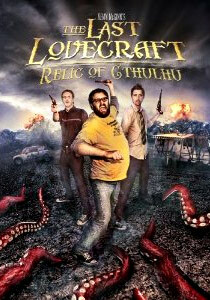 This movie is definitely a gamer's delight because of the comic book references (flashback stories are told as animated comic book sequences), ridiculous geeky behavior (a guy wears a Cthulhu mask and he actually has a "Mastercraft Quality copy of the relic mentioned in the title of the movie). And combat skills? Forget it. These guys are in the physical condition of many standard gamers: too skinny or too fat. When geeky Paul runs from the cultists to draw them away from Charlie and Jeff (the latter being the titular "Last Lovecraft"), he actually calls for a time-out as he doubles over gasping for breath from his 100-yard dash. A bit cruel to gamer/fanboys? Possibly... but all too true. Enjoy the OFFICIAL TRAILER here. SUMMARY: If you enjoy humorous sci-fi with a hint of horror (there is some gore and rough language, so don't show this to the kiddies until after you've watched it through yourself). If you don't come in expecting a brooding, dark movie, you will probably enjoy this. It's a fanboy fiesta of phantasmagorical proportions for those who like fun, frivolity, and aren't afraid that Cthulhu will devour their sanity. Check in Friday for my Media Review or one of my Rants. Comics: So, you've got 10,000 comic books... now what? I guess these are the spoils of my youth. Boxes and boxes of four-color adventures ranging from the incredible to the sublime, from the ridiculous to the Pulitzer Prize winning (yup, a comic book has won the Pulitzer Prize... look it up -- that's what google is for, y'know!). All stuffed into about 22 long boxes and 10 short boxes. If you're not sure what I mean by "long box or shot box," then your life is probably geek-free. Long boxes are about 28-inches long and hold a standard modern comic book: L 27.25 X W 7.5 X H 10.8. I get single boxes from my local comic book shop, Bedrock City Comics in NW Houston. And I buy my bulk boxes from Bags Unlimited. 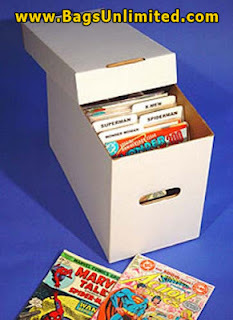 These are the standards for comic storage. The good ones are made of white, acid-free card board and they are have handles cut in them so you can lug them around. Some of the newer ones even have pull-out drawers built in so you don't have to stack/unstack them to get at your stash. These are cool, but I decided it was not worth the expense because I would need to replace older boxes to make them work because I would have to replace a lot of my old boxes that are still perfectly good, even though some of them were purchased before 1984. Here's a picture of a short box from the Bags Unlimited Web site. What's really cool (to me, anyway) is that even though I didn't take this picture, I actually have all three of the comics they show here. Wonder Woman #300, Action Comics #500, and Marvel Tails #53). I wouldn't call it a nerdgasm, but it's still pretty darn cool to see them in this photo. Comics Talk is continued on Mon. Check in Friday for Netflix Friday! When I got married 12+ years ago, I was renting a house and my wife owned one, so we moved into my her place. At the time it was too small for all of my furniture, books and other stuff, so it went into storage. About two years ago I got a letter from the storage place announcing a price hike... and that got me thinking. My stuff had been in storage for 10 years. It started out at $40 a month and was now going to hit $65 a month. Even if you go with an average of $50 a month for 10 years, that comes out to more than $6,000! Since we now live in a bigger house, I decided it was time to bring it all home. I hired two guys for about $120 and they brought it all home: dozens of boxes of books, some furniture, and of course... thousands of comic books. I've been an avid comic book reader since I was a kid, and a collector since my teens. I've got comics dating all the way back to 1939 through the present (although I don't buy as many as I used to, and even then it's not the stuff you'd expect). Most of the collection ranges from the late 1970s through the 1990s, with the bulk of it falling in my collect years from the mid 1980s. Now, when I say I've got a lot of comics, people always ask, "How many?" The honest answer is, "I don't know." That seems silly, and yes, I can guess, but I really can't say for sure. I can say, at last count, I had 22 long boxes and about 12 short boxes. Most of these are jam packed with comics, but not all. Some of them have old paperbacks in them to act as "spacers," others have miscellaneous stuff and even empty boxes to make room for future additions. About half of them are bagged properly. Long boxes hold about 300 comics. Short boxes hold about 180. This doesn't include about 500 comics digests and a few hundred magazine-size comics. So, all in all, I've probably got about 10,000 comics in the house. Now, of course, that leave me with the question of what to do with them. I mean, I could just leave them in boxes, or try to sell them, or (heaven forbid) actually reread them... But I guess the first thing I need to do is figure out what I've got, how much of it I want to keep, and figure out a way to winnow down the collection into something manageable. For the next few weeks, I'm going to talk about this journey. I'm going to talk about the specifics of my collection (how I'm sorting it, how I'm cataloging it, storing it, protecting it, possibly monetizing it) and I'm also going to talk about the general issues involved with any type of collecting. Along the way I'm going to hit some of the physical, practical, financial and emotional issues that come with having a lot of stuff. Comic Talk continues on Mon & Wed..
Come back on Friday for Netflix Friday!